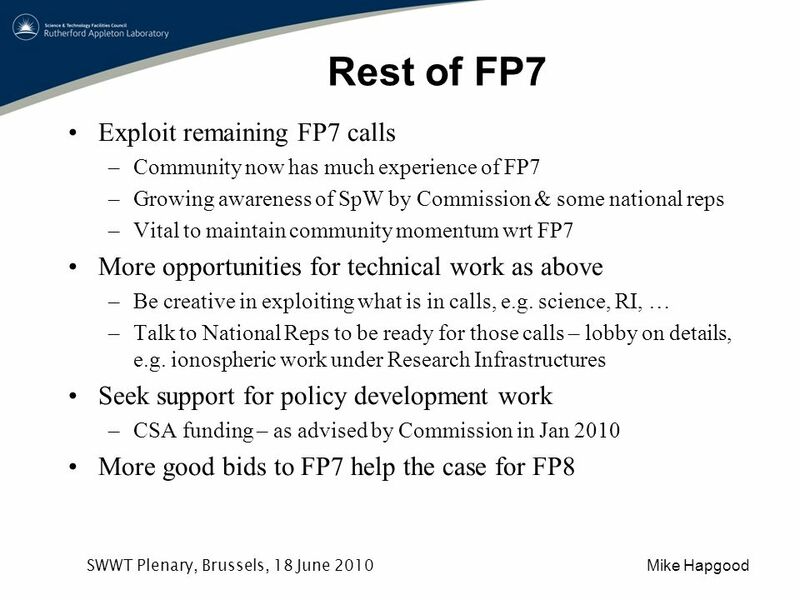 4 Mike Hapgood SWWT Plenary, Brussels, 18 June 2010 FP8 Lobby NOW for extended coverage of Space Weather Identify which current programme areas to press on: –Space – what is logical way to extend current SpW element? Should it more explicitly include ground-based impacts? –Security – push hard on space weather as a risk to civil security. The GIC and GNSS cases are extremely strong –Research Infrastructures. Natural home for ground-based measurements. Ionosphere is a strong focal point because of existing work on EURIPOS and EISCAT-3D –Transport – major SpW issues in aviation and shipping –What else? 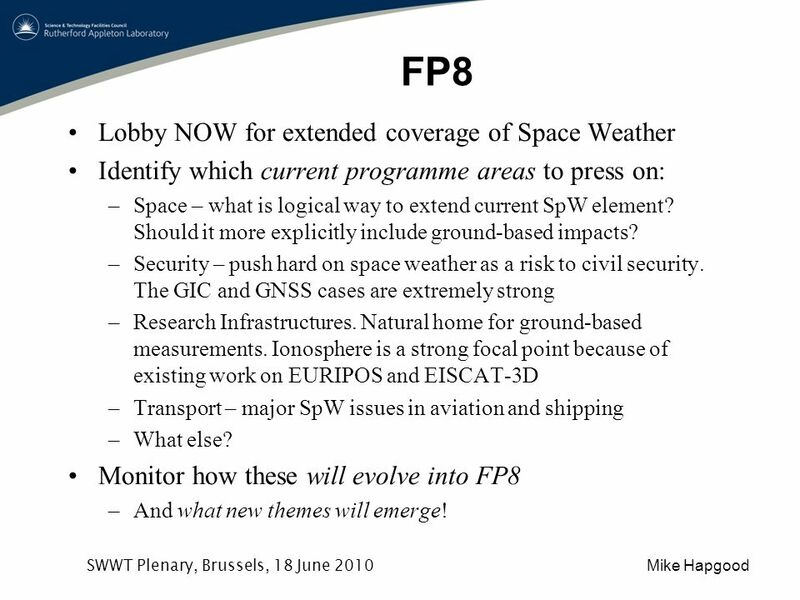 Monitor how these will evolve into FP8 –And what new themes will emerge! 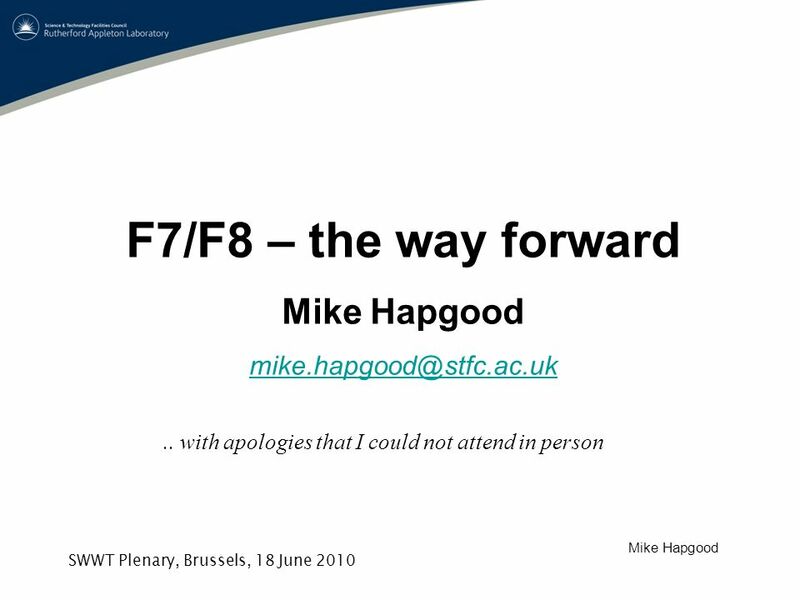 Download ppt "Mike Hapgood SWWT Plenary, Brussels, 18 June 2010 F7/F8 – the way forward Mike Hapgood with apologies that I could not attend." Interlink I Kick off meeting I 3 rd of december 2007, Sofia INTERLINK WORKSHOP 7-8 JULY 2009 PRETORIA. 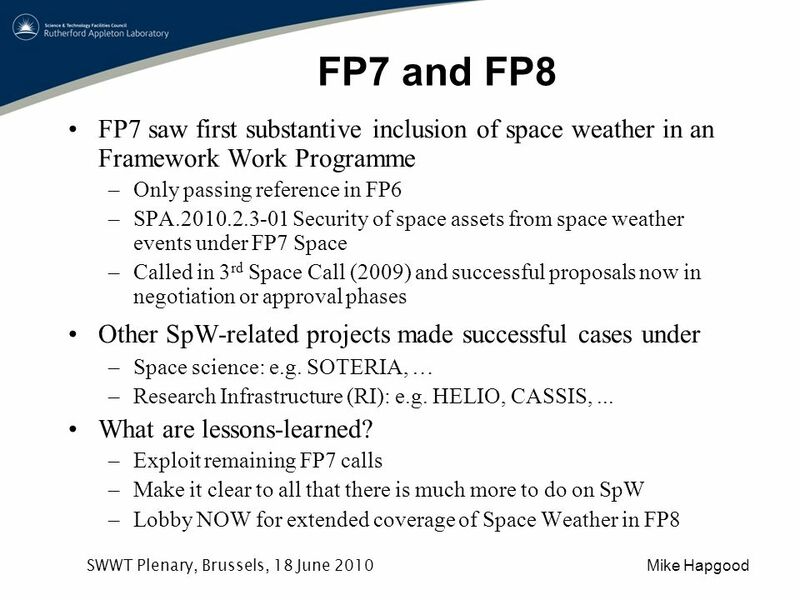 SWWT Space Situational Awareness Briefing for SWWT topic groups Mike Hapgood Chair, ESA Space Weather Working Team. Ground Effects Topical Group ESWW4 Brussels 2007 Spokespersons Risto Pirjola (FMI, Finland), Alan Thomson (BGS, UK), What are we interested. 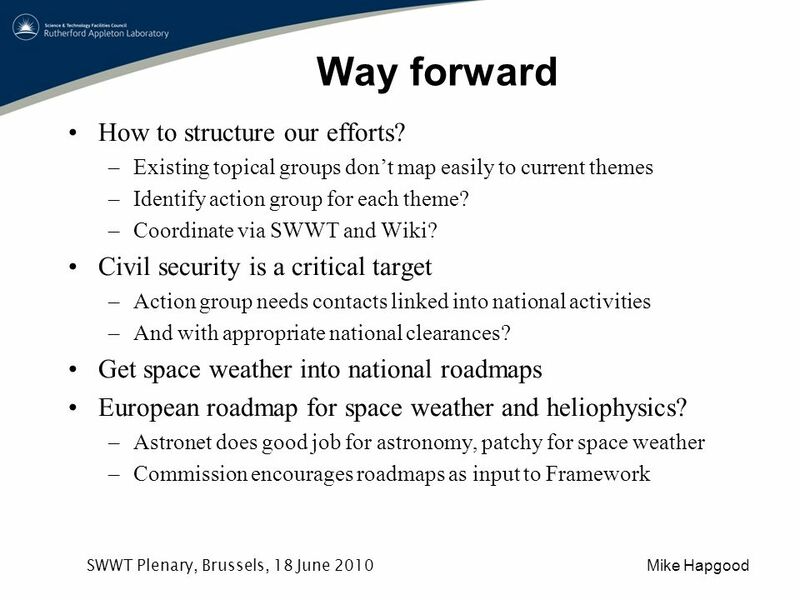 On the Potential Scope for and Role of an SWWT Roadmap. 29 November Research Infrastructures in FP7 Jean-Louis Picqué European Commission DG Research. GEO Work Plan Symposium 2011 Days 2 & 3 Presentation of ID-02 Catalyzing Resources for GEOSS Implementation for Plenary Session. - 1 - EPP-ED Public Hearing : 12 June 2008 The importance of GNSS (Galileo/EGNOS) Views from the forthcoming Council Presidency By Raymond ROSSO French. DG INFSO- Grid Research & Infrastructures: W. Boch, M. Campolargo 1 Delivery of Industrial-strength Grid Middleware: establishing an effective European. FP7 Security Theme /1 FP7-SEC INFO DAY Sept – Brussels Clément WILLIAMSON - European Commission – DG Enterprise & Industry 4 Security missions.